Brown's Custom Jewelry - The place where you buy your own design. Not an over priced so called design item. N Wade Brown managed his first jewelry store at the age of 21. He purchased his first jewelry store at the age of 27. He attended the Gemological Institute of America, which is the only widely recognized gemology school in the US. He has owned several jewelry stores and worked as a wholesaler. His attention to detail and commitment to delivering the best quality craftsmanship to his customers is obvious in the final product. As a jewelry artist and designer, his philosophy is to start with a concept and pursues a line of questioning of the customer's wants and needs to deliver a piece of jewelry that is the perfect union of taste, cost, and functionality. 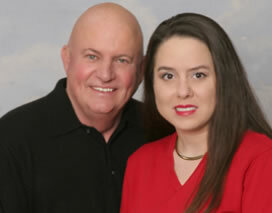 Candace Brown has been in the fine jewelry business for over 18 years. She began her career in jewelry by working for a family owned retail store. On March 26, 2010 Candace Brown completed her Graduate Gemologist Degree with the Gemological Institute of America. Some of Candace's talents include: a great ear for listening to what their clients want, extra ordinary vision, great imagination, incredible passion for people and jewelry! Candace is insightful and very creative. Wade and Candace have been happily married for 20 years. Some of their hobbies include: traveling, golf, enjoying good wines, philanthropy, attending Christian church, and spending quality time with friends and family. Virtually, all of their clients inevitably become their friends! Rings shown are sold pieces that have been custom designed for our clients.